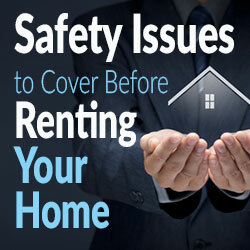 Landlords have several responsibilities when renting a home and many have to do with the safety of their tenants. Certain systems must be included in the home in order to comply with local regulations. It is up to the property owners to take the steps required. Whether you are considering renting your home for vacationing families or on a long-term lease, keep in mind these safety issues. All homes must be equipped with smoke alarms. These systems should be equipped with long life batteries and tested on a regular basis to ensure reliability. Some larger apartment or condominium complexes may include a sprinkler system, but detached or semi-detached houses can get away with adequate smoke alarms. Check with your local building code to find out how many units are needed. Provide a fire escape plan for your tenants. Keep the fire doors and windows clear of obstructions and properly maintain these fire exits. In some cases a stairway will need to be constructed to provide a fire escape from upper floors. Also be sure to mount fire extinguishers on each floor in convenient locations, near the kitchen and garage, as well as the bedrooms. Your tenant agreement should include restrictions on the use of open flames inside the building, as well as limitations to outdoor features such as barbecues and fire pits. All elements of the electrical system should be inspected before a tenant occupies the building. It’s a good idea to leave out the owner’s manuals for all electrical appliances within the property, and provide the tenant with a place to keep this paperwork safe. Show the tenant the main breakers or fuse box, and provide a supply of fuses if applicable. Ensure the breakers or fuses are properly labeled and that the entire system has been installed and maintained by a licensed professional electrician. If you have gas appliances on the property, such as gas dryers, gas stoves and gas grills, ensure that the manuals are available. Have all gas lines marked with a yellow marker for identification and indicate the location of the main gas valve. Instruct your tenants how to turn the gas off should a problem arise. Carbon monoxide detectors should also be installed and tested on a regular basis. These monitors help to reduce the risk of accident and illness should a gas leak occur. All windows and exterior doors should be fitted with durable locks. If a security system is installed, ensure that your tenant has the access codes. Consider installing a peephole in the main door to enhance security when opening that door. Your home should be fully insured against fire and flooding damage. 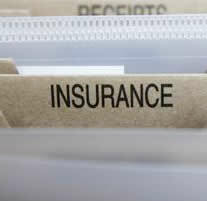 Let the tenant know that they are responsible for obtaining insurance to protect the contents. Keep up on all general maintenance issues, such as repairs and replacements, and hire professionals to keep clear snow from the walkways and driveway in the winter months. The safety of your tenants is of utmost importance. Take all of the necessary steps for fire, electrical and gas safety to provide your tenants with a safe, comfortable home. You’re also protecting your property and ensuring a return on investment for years to come. Shannon Ryan is the online community manager for the Nusite Group, a Toronto waterproofing and specialty trades company. One of the latest trends that’s receiving a lot of attention in the media is the Internet of Things (IoT). IoT is a term used to describe the ability to connect a device to the Internet to collect data on things like temperature, lighting and the presence of people. The idea is to make everyday devices “smart.” For example, a smart refrigerator can notify you via a smartphone or tablet that you’re running out of milk, and a smart dishwasher can be programmed to run overnight when energy costs are lower. While many of these devices are still in their infancy stage and come with a premium price tag, there are some modestly priced IoT devices designed to save users money. For example, home automation systems can be programmed to dim the lights and lower the temperature when you’re at work. The IOT can help rental property owners who are looking for new ways to provide value to their tenants and stay ahead of the competition with little associated cost. Since security is a chief concern of both tenants and building owners, it’s logical to start there. Wireless sensors are available today that allow property owners to offer tenants enhanced security without a recurring monthly fee. These sensors are inexpensive and can be installed in individual rental units. Tenants can easily program the sensor through an app, which allows them to customize their security. For example, if the tenant is gone from 8 am to 6 pm weekdays, they can program the security or motion sensor to automatically turn on during this time. If the device senses that something is awry, it connects through the building’s existing Wi-Fi and notifies the tenant via phone call, text message, email or Twitter. Early notification can help thwart other break-ins in the same building. Once the sensor is purchased, property owners benefit from providing tenants enhanced security without the need for monthly monitoring fees or for false alarm charges from the police. Since sensors are portable, property managers can move them from one unit to the next, as needed. Wireless sensors also can be used to secure and monitor other areas that should be restricted, such as equipment closets and the rental office, notifying managers and building owners if an area is accessed. Since wireless sensors run on batteries, they can be used in areas without electrical outlets, such as pool areas. The sensors can be programmed specifically to provide notification during non-office hours or other “closed” hours, limiting the property’s liability. In addition to security, wireless sensors are available that can monitor for the presence of water and then notify the building manager so damage is minimized. Since water damage can be expensive to repair if not detected early, this is a valuable benefit to building owners. Wireless sensors also can play an important role in keeping energy prices down, both in common areas and in individual rental units. Sensors can be used to monitor temperature swings, which gives property owners better control over heating and cooling bills. 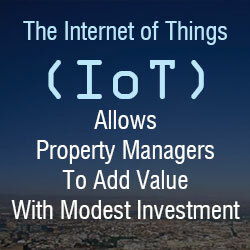 IoT also provides a huge opportunity to better serve renters, as well as offer other streams of revenue for property managers. The use of sensors can allow property managers to be more aware of what is going on in their properties and provide a better experience for their tenants. Services like monitoring and adding security to a unit can be used as new revenue streams or upgrades for renters, which can be obtained without recurring costs to the property manager. This provides services that renters want and new ways for property managers to differentiate themselves and make more money. In the end, everyone wins. What is an illegal unit or also known as illegal apartment? Typically, an illegal in-law unit or illegal apartment is one that was built without permits, or one in which the rooms were constructed with the blessing of the building inspector, but with the kitchen or stove put in afterwards. Another way to determine this is by counting the number of units in the building and comparing this with the “Certificate of Occupancy” issued by the City. The benefit for the landlord of owning a building with an in-law unit is the extra cash flow it produces. This article will explore some of the risks of such an endeavor and how they can best be managed. What are the problems with illegal apartments and in-law Units? The tenant can be evicted from the illegal unit and the landlord may have to make them a stiff relocation payment (presently $5,101 per tenant, maxing at three tenants, plus possible extra money for the disabled or elderly). There are also some theories that tenants can claim as justification for the repayment of part or all of the rent that they paid while they were living in the unit. Additionally, there is the potential for habitability claims since, quite often, the unit does not conform to building code requirements. Sometimes there are serious safety lapses due to the fact that there is lack of a second exit. This can result in an affirmative lawsuit by the tenants for these conditions. Sometimes the landlord has the proper type of insurance and sometimes not. Therefore the cost of defending these lawsuits can often be considerable. It is important to note that when selling the building the non-complying unit should be properly disclosed as an illegal unit without any attempt to embellish it. If the building inspector issues a Notice of Violation, the owner will likely be forced to remove the unit. How should the landlord properly terminate such a tenancy? If the building inspector has issued a Notice of Violation, under the local San Francisco ordinance the landlord will need to obtain permits and issue a proper eviction notice. This will usually require sixty days notice (30 days if the tenancy is a year or less in duration), and payment of the relocation money mentioned above. Typically, as there is no legitimate defense since the landlord seemingly has no choice in the matter, these cases are rarely contested. However, the tenant can still bring his affirmative claims. In some cases, the tenant will have breached the rental agreement and this may allow the landlord to sue them for nonpayment of rent or nuisance. Interestingly enough, the courts will not enforce the terms of such a rental agreement, because it is considered an illegal contract. However, other court decisions have held that the landlord should be able to recover possession of the premises, i.e., terminate the tenancy. Therefore the landlord could bring a nonpayment of rent case, and certainly a nuisance case, and recover the unit, while most likely not recovering a money judgment in his or her favor. In that scenario, the landlord could avoid paying the relocation money to the tenant. Of course, each case depends on its merits, and sometimes the landlord may agree to pay some voluntary relocation money to the tenant, to avoid the cost of trial. How Owner of illegal In-Law Units and Illegal Aparments may avoid being sued. First of all, the landlord should obtain an appropriate insurance policy for an income property, rather than a homeowner’s policy. The owner should also be sure that there is coverage for claims such as “wrongful eviction” and other broad forms of liability. It could also be helpful, despite the downsides, to the landlord initially disclosing to the tenant that she is renting an illegal unit. That way, at least, the tenant would not be able to claim that she was defrauded into renting an illegal unit. It is common that utility bill disputes arise in these situations because the tenant is not afforded her own individual meter. These minor disputes can erupt into major litigation. The same can also happen with security deposits. The landlord should be careful to avoid disputes with tenants and refund deposits in full. We also often see personality disputes, since sometimes the landlord is living upstairs and the tenant right below, and noise and even cooking smells can easily permeate from one unit to the other. Often no one is to blame for this since the extra unit was not built into the original design for the structure. It is also helpful if the landlord is careful in selecting their tenants. Getting a personal recommendation from a friend or family member can be helpful. In general, a landlord is best advised to treat his tenants with respect and understanding. In particular, the landlord should understand that renting such a unit puts him or her in jeopardy of some or all of the consequences outlined above. As in most personal and business relationships, some effort at keeping peaceful communications in place may very often preserve the relationship as a healthy and profitable one for the owner, as well as for the tenant. For more information about renting illegal in-law or illegal apartments contact Steven Adair. Steven Adair MacDonald, Esq. has been representing landlords and tenants in San Francisco since 1982 and is the author of two books, Landlord Tenant Solutions in California , and The San Francisco Rent Board User’s Guide . Los Altos is one of the strongest real estate markets in Silicon Valley. It’s one of the most popular destination towns for both local and relocation clients, offering large lots, a rural feel, and one of the best school districts in the state. Los Altos is one of the most expensive markets in the country and difficult to get into at any price point. Buyers shopping in the Spring of 2011 were faced with multiple-offer situations, homes selling well over asking price, and a limited selection of inventory in all but the most expensive price ranges. There were sales of single-family homes under $1 million for a few heavily discounted properties in bad locations to homes sold at $4 million or more. There were many new or newer homes sold this year and those helped raise the bar across the board. Commentary: The most important statistic is that the average sales price for new, single-family homes was up 4.8% for the year. Honestly, if not for several homes that are more like townhouses sold in the $900K-1.1M range, I think that figure would be a lot higher. That figure is going to continue to increase in 2012 as sales in December were very strong and the year ended with substantially depleted inventory. Buyers in Q4 had almost as hard a time finding homes as those in the Spring. 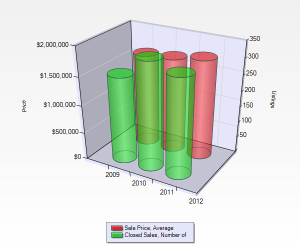 The Los Altos market was up 1.9% in 2010 and with the current shortage of inventory, 2012 is likely to be the third year of increases. 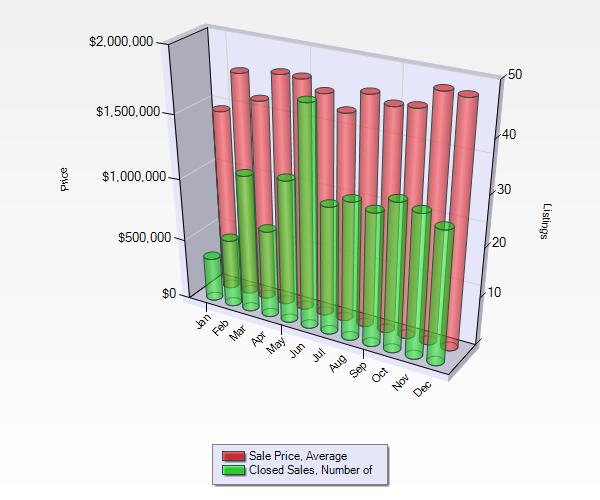 The biggest factor driving Los Altos home prices is inventory, specifically a lack of it. There are not enough homes to meet buyer demand and that was exacerbated last year. New listings were down over 12%, even with a slight reduction in homes sold, that’s still a nearly 5% gap in demand. When you look at how many homes had sales prices over the asking price, it’s roughly the same number. The number of days on the market tells the demand story. The days on market statistic is down to 40 which is among the lowest of any town in the area. Given that most homes go on the market by Thursday, have tour on Friday, open house on the weekend, and offers the following Tuesday, the average home is actually selling in 5 days with 35 days for financing. What’s interesting about that is more and more homes are selling for cash. That’s getting more closings down to 21 days or less, which is bring this number even lower. 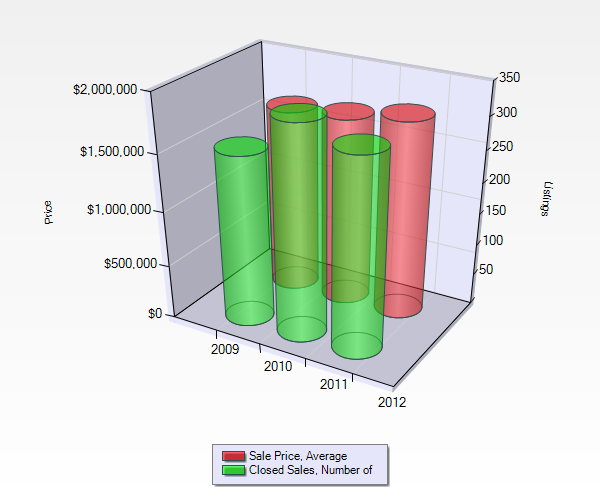 Buyers in 2012 can expect this trend to continue. 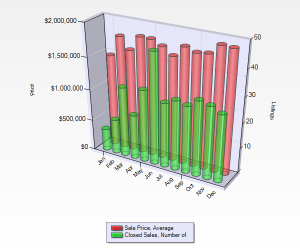 This report does not include a price per square foot figure, because it is a much more detailed number than just the generic figure for all homes sold. I break down the sales by size and age of home which gives an accurate view of that calculation. That analysis will appear in a separate article. If you want the details before that is published, call me. I think that statistic has some value in negotiating during the following year but only as a guideline.